Citrate Concentrate | Renacon Pharma Ltd.
RENACIT is Bicarbonate Hemodialysis Concentrate which contains Sodium Citrate as buffering agent replacing significant amount of Acetate, normally present as buffer. The quantity of Sodium Citrate is very low as compared to that needed for systemic anti-coagulation hence its anti–coagulatory effect is only in extra-corporeal circulation. RENACIT Part-A is available in solution form & Part-B in powder form. 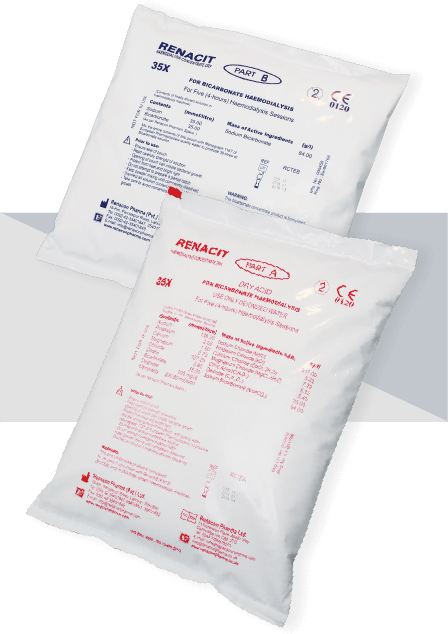 RENACIT DRY is available in powder form (Part-A & Part-B). Patients with Acetate-related complications like frequent episodes of hypotension, arrhythmias, nausea, etc. Patients with Heparin-related side-effects viz pruritis, osteoporosis, accelerated atherosclerosis, etc. RENACIT contains a small amount of anticoagulant (Citrate) which prevents clotting in the extra-corporeal circuit without increasing bleeding tendency. Citrate dialysate can only be prescribed by, or on order of a physician. Use cartridge or B-Part concentrate as usual. To achieve adequate anti-coagulation Dialysate flow may be increased to 600ml/minute. Micro-bubbles cause increased clotting of fibres/circuit hence make sure no air (micro bubbles) are in the extracorporeal circuit before connecting the patient and during dialysis. Reduce the Heparin dose in steps until required ACT or aPTT levels are achieved. In case of Heparin-induced Thrombocytopenia or Heparin allergy stop Heparin and use saline flushing along with use of RENACIT Concentrate to avoid clotting and achieve adequate clearances. Pay special attention to the Venous pressure and clotting in lines if Heparin eliminated or significantly reduced. If there is tendency of frequent clotting of dialyzer/lines, RENACIT can be used with the normal Heparin dose. If RENACIT Part-A solution is still available after Dialysis it can be used for the next Dialysis session. Electrolytes like Calcium, Potassium can be added in Part-A as per Physician’s choice. Rarely in case of very low Calcium in patient’s blood signs of Hypocalcemia may appear. Calcium binds with Citrate and hence use of Citrate dialysate will temporarily, during dialysis only, decrease ionized Ca levels by approximately 10%. Assess the patient during treatment for signs of hypocalcemia: numbness/tingling around the mouth, spasm of hand muscles (Tetany), unusually long and strong muscle cramps(not related to Hypo-natremia). If symptoms occur, place the hemodialysis machine in bypass and give I/V Calcium Gluconate slowly although even otherwise symptoms should resolve in minutes as Citrate is quickly metabolised in the body. Q: Is frequent or continuous intra-venous Calcium is necessary during Hemodialysis with RENACIT? Answer: No. Calcium binding by dialysate Citrate is very small and only 10% of the Ionized Calcium may decrease in the blood. There is also the usual amount of calcium in the dialysate. Q: How does Citrate dialysate function? Answer: Citrate, being an anti-coagulant, is present in very little amount in the Dialysate. Hence anti-coagulation effect is only in the extra-corporeal circuit and it is rapidly neutralized upon entry in the systemic circulation. 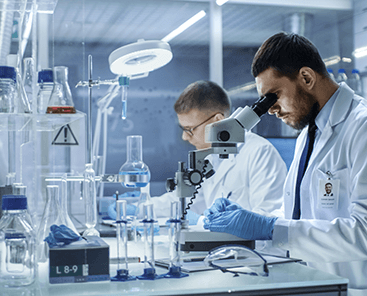 Q: Is it necessary to check clotting times when RENACIT is used? Q: Is there reason to be concerned about bleeding risk? Answer: No. Citrate is a local anticoagulant, it means that it does not have systemic anticoagulation effects. Once blood is returned to the patient the citrate is uncomplexed from calcium and is readily metabolized. Q: Is there reason to be concerned about hypocalcemia, or hypomagnesemia when treating patients with citrate dialysate? Answer: The concentration of Citrate in the dialysate is low, so is the risk of hypocalcemia or hypomagnesemia with normal concentrations of dialysate calcium and magnesium. Q: When using RENACIT what changes I should make in the present Dialysis System? Answer: No changes are required.The existing Dialysis system is fully compatible to use RENACIT. 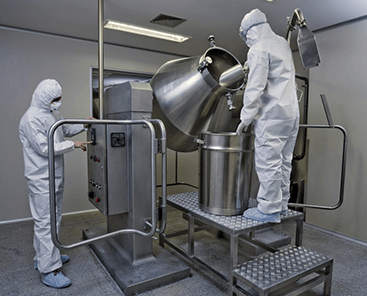 Q: What are the advantages regarding Dialyzer Reuse? Answer: Dialyzers’ fibers are properly cleared with use of RENACIT hence number of dialyzer reuse increases while clearances (Kt/V) increase or remains fairly good. Q: Is RENACIT much more expensive than other Bicarbonate Concentrates? Answer: No. Inspite of significant advantages there is no significant difference in price.